Mendeley is a free citation management software system. Its features include the ability to manage, share, read, annotate, and cite reference papers. It supports private and public collaborations, and offers 2 Gb of online storage. You can purchase additional storage and the ability to create larger groups for private collaboration. Mendeley has a desktop and online component. Mendeley Desktop is the downloaded part of the software installed on your computer. It can be added to more than one computer. Mendeley Web is the website where you access the web version of your library. To ensure all libraries are up to date, “Sync” your libraries each time you open Mendeley or add new references. You need to create an account to use Mendeley. Click the “Create a free account” tab on the Mendeley website. 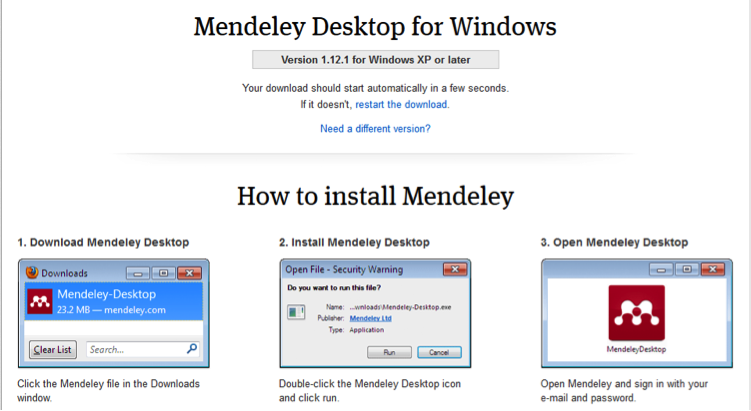 Download the Mendeley Desktop based on your operating system. It is available for Windows, Mac, and Linux operation systems. Once you've downloaded and installed it, the Mendeley logo will appear on your desktop. After following the set-up wizard, you will be prompted to login using your email address and password. Citations can be imported from websites, library databases and PDF documents. How to import the citation depends on where it is located. One option is to drag and drop a PDF file or folder, on your computer, into your Mendeley Desktop. The citation information will automatically be extracted and organized by title, author, year, journal name, etc. This information is only as accurate as what the publisher provides. It’s a good idea to check the citation information once you have imported it into Mendeley and correct any errors and/or omissions. For the first time, go to www.mendeley.com/import. Drag the “Save to Mendeley” button to your bookmark toolbar. Find the article you want on the web. Click the “Save to Mendeley” bookmark. The article details will display on the right hand side of the page. If all looks good, click the “Save” button. The bookmark saves the citation to your Mendeley web account. To view the article in your Mendeley Desktop library, return to Mendeley Desktop and click “Sync” located on the top toolbar. You will see the file you just imported. Mendeley provides a plug-in for Microsoft Word that makes adding citations to your articles easy. To start, launch the Mendeley Desktop and select “Install MS Word Plugin” from the Tools drop down menu. NOTE: MS Word must not be open for the installation to work. When you see the successful installation screen, click “OK”. The screen shot below shows where you will see the Mendeley plug-in in the MS Word toolbar. When you are ready to insert a citation in your document, click on “Insert Citation” in MS Word. You, will have the option of searching Mendeley for the article either by author, title, etc. or going to your library and selecting the article. Once you have selected the article you want to reference, click the “Cite” button image to import the reference into the document. When you are ready to create a bibliography, go to Mendeley toolbar in MS Word and click on “Insert bibliography”. A bibliography using all the citations in your document will be created. Mendeley has over 6000 citation styles to select from. Mendeley facilitates the management and formatting of citations. However, it is vital that you check the citation data at the import stage and check the formatting of your in-text citations and the generated bibliography to ensure the completeness and accuracy of the data captured or the references being produced. For more assistance for Mendeley, check out Mendeley's Help Guides and their YouTube channel. Contact us for assistance with Mendeley questions and problems.